Does it still make sense to own a Blu-ray player? Depends. Do you own a 3D-capable TV? Do you not own a Roku box? Do you still like to rent or buy movies that come on shiny silver platters? Then I'd say yes, a Blu-ray player is just the thing. 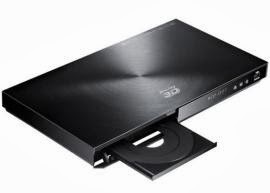 Like this one: Today only, and while supplies last, Tech.Woot has the refurbished Samsung BD-EM59C Blu-ray player for $49.99, plus $5 for shipping. I've seen Blu-ray players that low before, but not with this feature set. The player also has built-in Wi-Fi and Samsung's Smart Hub, which allow for Roku-style streaming from a wide range of services: Netflix, Hulu Plus, Spotify, YouTube, and so on. It supports DLNA, too, so you can stream stuff from your PC or phone. This makes it a pretty decent media hub even if you don't spin a lot of discs. That said, most home-theater enthusiasts will tell you that for the absolute best picture and sound, Blu-ray is the only way to go. So whether you're building a theater from scratch or just looking for a Blu-ray upgrade, it's hard to beat a player that does it all for just $50. And the user reviews on Samsung's product page are solid for this model, which is unusual because a lot of Blu-ray players tend to get trashed.